Yogurt is a widely consumed dairy product that is considered nutrient "dense." It is considered to have high nutritional value because it has a balanced nutrient profile that includes protein, carbohydrates and fats. According to the Dairy Council of California, plain low-fat yogurt has higher levels of nutrients than plain yogurt made with whole milk. Yogurt makes a tasty snack as well, which makes it a healthful substitute for sugary snacks that have relatively little nutritional value. Yogurt contains numerous minerals, including calcium and potassium. The U.S. Food and Drug Administration, or USFDA, daily value for calcium is 1,000 mg, with a cup of plain low-fat yogurt providing 415 mg of calcium. The live cultures present in some yogurts also improve the absorption of calcium. Calcium is important for maintaining healthy bones and teeth. Yogurt can also be digested by most people who are lactose intolerant, so it can provide them with needed calcium. Potassium is a mineral that is important for the transmission of nerve impulses, proper muscle function and maintenance of a healthy fluid balance. The USFDA daily value for potassium is 3,500 mg. According to Drugs.com, 6 oz. of plain low-fat yogurt contains 398 mg of potassium. Yogurt is also a source of the minerals magnesium, zinc and iron. Vitamin B-12, also called cobalamin, is one of eight vitamins that make up the vitamin B complex. Cyanocobalamin is the synthetic form of B-12 that is found in many supplements. Cobalamin supports energy levels, stimulates the use of proteins, carbohydrates and fats, and stimulates growth in children. The USFDA daily value for vitamin B-12 is 6 micrograms. The Dairy Council of California states that a cup of plain low-fat yogurt contains 1.37 micrograms of vitamin B-12. In general, vitamin B-12 is found in meats, fish and organ meats, so yogurt could be a valuable source of the vitamin for vegetarians. Yogurt also contains vitamins B-2 and B-5, also members of the vitamin B complex. A cup of plain low-fat yogurt contains 12 g of protein. The USFDA daily allowance for protein is 50 g. Protein is important for tissue repair and replacement. The relatively high level of protein in yogurt makes it a good choice for vegetarians. 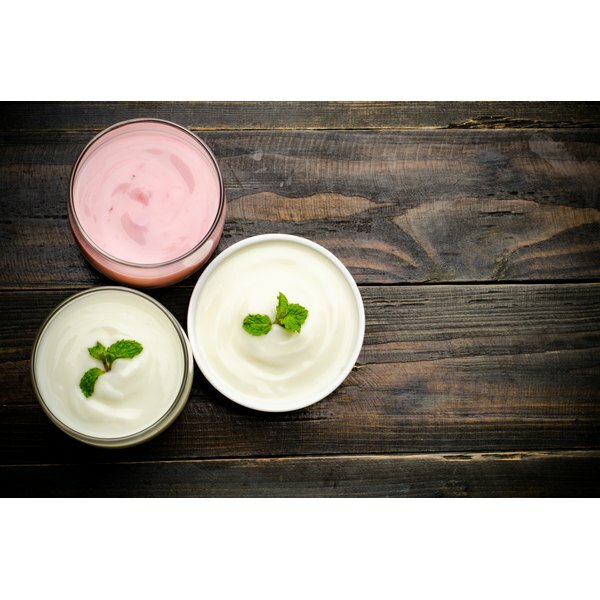 Most yogurt contains active strains of microorganisms; however, some are enhanced with probiotic strains. Probiotics, such as lactobacillus and acidophilus, are considered "good" bacteria because they can be beneficial to your health. According to HealthCastle.com, probiotics may improve the bio-availability of nutrients such as B vitamins, iron, zinc and calcium, among others. Probiotics may also promote the growth of healthy bacteria in the small intestine. This potential benefit is important to individuals who have taken antibiotics, as antibiotics destroy both "good" and "bad" bacteria. Not all yogurt contains active cultures, so look for "contains active yogurt cultures" on the label. Is Yogurt Good for the Immune System?